Pocket Planner Tutorial: Stampdoc Rocks! Wondering how to make a Christmas pocket planner? Go from zero to sixty with this video tutorial from The Stamp Doc. This Christmas pocket planner is built using a simple pocket folder, decorative paper and stamped embellishments. Back-to-school promotions are underway now, so check around to find pocket folders for as low as ten cents! 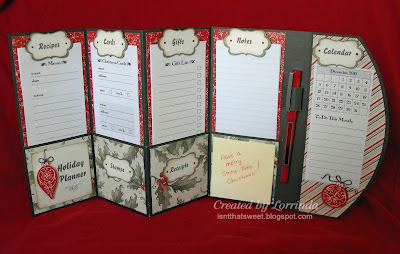 Then stock your planner with right-sized printable Christmas pocket planner pages ... and get organized for Christmas! Big binders aren't the only way to go when it comes to creating a Christmas notebook. 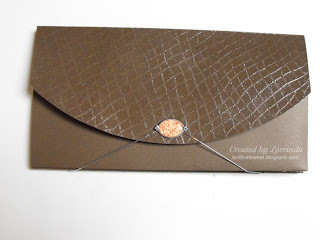 Check out this slimmed down version from Laurie, who blogs at Thru My Cottage Door! Built from a simple colored file folder, Laurie's Christmas planner features dimensional embellishments, patterned paper and perky ribbon loops. She's scaled her notebook to take Christmas pocket planner pages from Organized Christmas--and brought a whole new meaning to lean, mean holiday planning! Aren't these colors lovely? They almost remind me of a stained glass window! Today, papercrafter Martha, from the StampArtPapel blog, brings us a tutorial for a simple--but sophisticated--Christmas pocket planner. 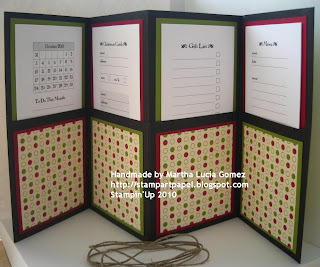 Using a black pocket folder for the base makes the holiday colors and patterned paper pop! With step-by-step photographs and clear instructions, Martha's tutorial will have you crafting up to speed in no time. Get organized for Christmas ... or for Christmas giving! Make an Easy Christmas Pocket Planner! Here's a pretty entry in the Christmas pocket planner category: a multi-year planner from Louise at the Home is Where My Craft Room Is craft blog. This elegant planner sports a distinctive color scheme using coordinated patterned papers. Inside, I really like the labelled pockets; no confusion about what goes where! Best, the project is easy enough for this crafts-challenged editor. And while Louise used a commercial digital product to print out her lists, it would be just as easy to use the free Christmas pocket planner pages offered over at Organized Christmas to fill pockets with printed forms.